A week from right now, we'll be snuggled up in our little house, falling asleep together for the first time in the little house we've spent the last 3 months building. Today was supposed to be a day of great achievement - Annie and Peps and Brett and I, busily finishing bits and pieces on said little house, getting it ready for move-in-able-ness. First thing this morning, Annie was removing some items from within the house in order to make room for ladders and such and, misjudging the depth of the newly-excavated front step, rolled her ankle in quite a serious way. Cue instant swelling of the foot and almost-tears from me - do we really have time for an injury right now?? Luckily, after some ice and some nurofen, Annie was back up the ladder, finishing off the little fence-paling details that have finally closed up the eaves. They do look lovely (though it took quite a while and several false starts before we worked out how to actually get it right), but it seems to us that pretty much anything, made out of old, lichen-covered fence palings, looks lovely. Peps, meanwhile, was digging these immaculate and perfect steps heading down to our soon-to-be-constructed fire pit. They correspond delightfully with the immaculate and perfect tyre retaining wall and steps that make up the front little level bit in front of the house. Hmmm tyre retaining wall...It was quite the discussion topic for quite awhile. I get it, I get, they are a waste product and they're free so yep we should be finding ways to use them. However they are so damn ugly! And it seems that the jury is still out on how much they leach, which is a concern given they contain volatile organic compounds such as benzene, and metals such as lead. So it's true, I would have much preferred a retaining wall made of sleepers or delightful rocks or some such. However in the end I couldn't get past the importance of using a waste product that we produce so much of and the free part was a little enticing too given how much this house building shenanigan costs. The tyre retaining wall is not looking it's best right now, despite the fine efforts of my dad, but come Spring it start to emerge as a site of loveliness. Due to concerns about chemical leaching there are to be no edible plants growing in or around the tyres but they will abound with perennial beauties which will hopefully render most of the tyres invisible, or almost so. After all these months slipping and sliding and rolling and tripping all over the slightly chaotic slope that used to be immediately out front of our door, it's unspeakably luxurious to have a decent-sized level bit. 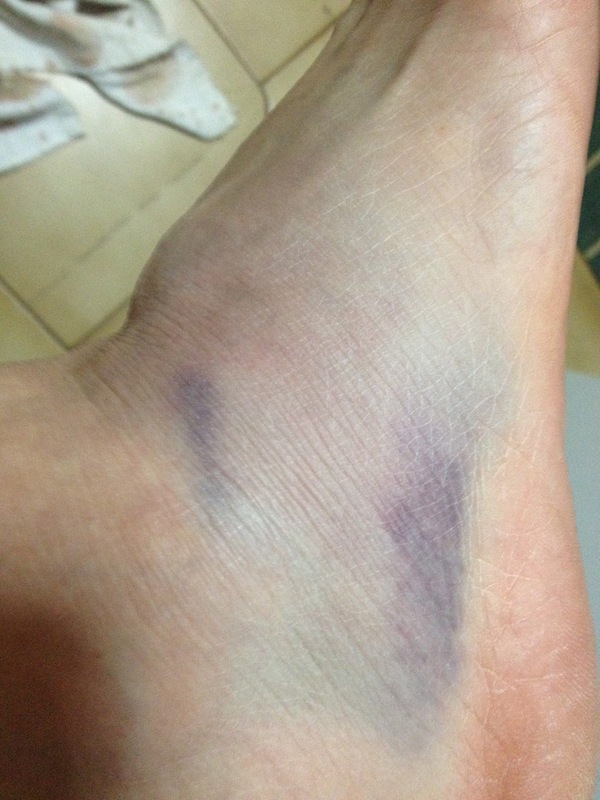 It's also kind of ironic that, through all the aforementioned slipping and sliding and rolling and tripping everyone who has visited the site managed to avoid injury and now, the first day it's level, Annie manages to do a number on her ankle, just while things are really hotting up. Hilarious. The whole thing's coming together now, and actually feeling like, yeah, we can move in in a week and, yeah, it's going to be kind of un-polished, but essentially, it'll be a cozy little house Yesterday, Brett and I finished off the corrugated iron patchwork of the ceiling inside, and now, with the almost-completeness of the eave-bits, the house is pretty much wind-and-draught-proof, which is a very good thing, and essential to our impending comfort given that Bega's still reaching sub-zero some nights. Yes, the ceiling is still looking a bit space-age, but soon we'll be painting it a Porter's colour called 'attic' and then, hopefully, it'll feel like a combination of being underwater and flying. And Olive just keeps on taking beautiful photos, from her very special little person point of view. and a cute little crocheted rose. I learned to make these on the day, and am now super excited to have a new crafty skill under my belt. And then it was time to return to working on our little house, which moves ever-closer to move-in-able-ness. People have been warning us NOT to move into a n unfinished house. apparently, if you move into an unfinished house, it never gets finished. I believe that this happens, but I can't see it happening to us. Time will tell, I suppose. For now, we have no choice, really. Whatever state our place is in in 2 weeks time, there'll be a bed perched somewhere in the house, with a family of 4 sleeping (hopefully) soundly. For now, on working days, our leftover bales are still acting as very rustic improvised tables and chairs for our equally rustic lunches of sourdough bread, chunks of cheese and homemade (and Cornersmith-made!) relishes. 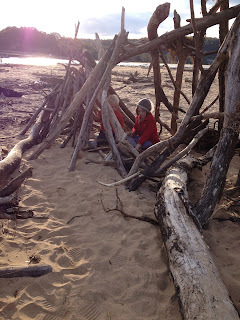 Then Peps arrived, and we decided to start working on the cubby house. The upright front legs are some telegraph poles from Eden tip. REALLY heavy and hard, but good legs for a cubby. It's not finished, but was a fun distraction from the 'serious must-do' work of the house. We continued working on our 'bath garden' landscaping, including these stairs (photo courtesy of Olive), and planting out some more lemongrass, geraniums, tansy, tree marigold and golden raspberries (from freecycle!) to treat ourselves with smells and tastes while we're bathing under the stars. And gazed at our beautiful winter skies. This photo, like the first in this post, was taken by our little Olive. Perfect. Ok ok so we are not so happy with our floor. It's not a failure, exactly, but it is a disappointment.. We had a vision of a luscious deep red brown smooth smooth earthen floor. We seem to have ended up with an insipidly brown, cracked thing called a floor. It is very cracked, which is far from unusual for an earthen floor. In fact many people make a feature of this and go for the flagstone look. This is not the look we were wanting, however it's the look we currently have. Check out that crazy stone paver look. Yeah, it's not so great. But we have a plan. We've patched the cracks with a lime/cement render (we seem to have A LOT of bags of cement/lime/clay left. Any takers?). And now we're gonna paint it. And yes it feels a little like cheating. Porters Paints have some very lovely low-VOC/No-VOC paints . We're quite taken by Sea Otter, though we think it's hilarious that there's a colour called Ox Blood. Almost like they're teasing us about our floor failure. We had thought that utilising the rammed earth approach would minimise cracking. We knew that our soil was a rich clay soil, perfect for floor-making however we were nervous about doing a poured earth floor on account of the length and unpredictability of the drying period. As we've mentioned we used the soil that had been dug from our top/future duck dam and given it had been sitting there for many weeks we figured it was probably quite dry. The Bega Valley has had very little rain for a few months now, actually the last big rain was the week of our straw bale building workshop in April. Oh the hilarity! Anyhoo we thought the clay would be fairly dry, however as soon as we got down below the surface we realised it was still very moist. Now this water holding capacity is a great thing, a truly great thing when it comes to our garden and orchard and general land productivity. But maybe, just maybe a rammed earth floor requires clay soil that is less moist. Our thinking is that less moist could equate to less unpredictability in the final outcome. It's ok. We have a year or two to further research, ponder, discuss and plan the earth floor for our next stage of building. It will be better next time. Because we've set ourselves a deadline. We will move in in two weeks. No more couch surfing for this family of four. However it's going to be rough and unfinished and probably a little crazy for awhile. So for now, things are a little heart-in-mouth busy, we're both suffering a little insomnia as we contemplate all that is to be done but still, it's all pretty good. Oh yeah and we got a Landcare grant of a thousand native trees and plants to help establish a wildlife corridor in our area. Hurrah! So floor schmoor, whether it ends up Sea Otter or Ox Blood it doesn't really matter. It's a teeny tiny house with a teeny tiny floor that we really enjoyed making but yes, we will do better next time. I heard once that if you find a job you really love you never have to work again. I've been working since I was 15, and have had tons of jobs of many and varied types, but it wasn't til I started doing bush regen that I realised the truth in the aforementioned statement. Bush regeneration was supposed to be a fill-in job after I finished my PhD. It was the perfect antidote to 4 years of very intense intellectual research and writing, basically alone, in a tiny little, poorly-oriented (ie dark and cold) 70s-built university office. 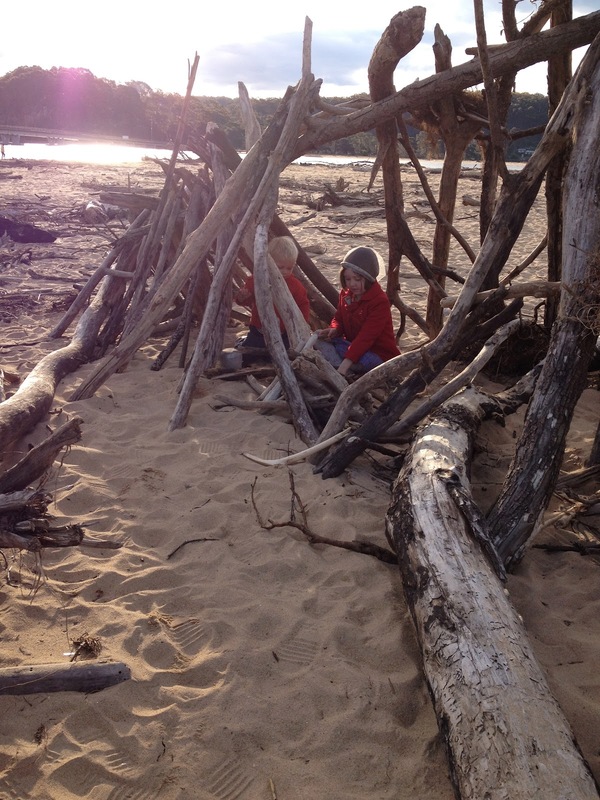 Bush regen was physical, outside, repetitive and social. I absolutely loved it, and ended up getting a qualification in conservation and land management and doing the work for more than 3 years, right up until we moved to Bega. Of course, there were days when I wished it would rain so I didn't have to go to work. Of course there were days when I would have rather been doing something else. But there were other days - a lot of them - when I had so much fun I actually felt guilty about getting paid. It just didn't feel like 'work'. That's how I felt on sunday. The job I have now comes a pretty close second to bush regenning in the rewarding-and-mostly-fun job stakes, and sunday was the funnest day yet. I hosted a rag-rug making workshop at the Quaama hall, facilitated by an awesome and crafty local lady called Patto. The under-side of one of Patto's proggy rugs, which has been used on the earth floor in her shed for more than 6 years! Basically, the day consisted of a bunch of awesome women sitting around in the glorious winter sunshine sipping tea, chatting, and learning the rudiments of making rag rugs using a piece of hessian and strips of scrap fabric. I've made a braided rag rug before (and am in the process of braiding and braiding for another, much bigger rug) but had never before encountered hooky and proggy rugs - the kind we learned about on the weekend. I'm pretty into them, and can't wait to get started. Just have the small matter of a dwelling for my family to attend to first. But I'm telling you now, our front door rug, and possibly many other rugs in our house, are going to be of the hooky variety. One of Patto's works-in-progress - an enormous hooky rug made using old tracky-dacks and t-shirts. The main reason I started my braided rug, and got interested in making more rugs myself, from recycled materials, is because a. bought rugs are really expensive, b. bought rugs that aren't made by really poor people in sweatshops are even more expensive and c. even though I do a lot of fabric re-using, there are still bits and pieces that are just too worn/stained/crappy to use for sewing, but still good enough to make me feel weird about sending them to the landfill (believe me a lot of fabric and clothing goes into landfill). Rag rugs, braided, knitted, crocheted, hooky or proggy are perfect for using up this kind of fabric. And once you've spent about a year making one with your own 2 hands, you won't mind spending more than a thousand bucks on a fair trade rug. If you're interested in learning about proggy and hooky rugs, I can highly recommend this book by a kind-of local lady called Miriam Miller. She even has a bit in there about using strips of plastic bags to make a bath mat. Awesome! And it's a super-easy thing to get started on, too. We had a 9 year old in the workshop, who is now totally obsessed with her rug - I got an email from her grandma today to tell me she hasn't put it down since she started it on sunday morning. Beautiful. One of the things I'm loving most about building our house slowly, by hand, with a variety of unusual and recycled materials is the intimacy that comes from sometimes spending painstaking hours on restoring or preparing something. Yesterday I sealed the gable end that will form the bed head in our sleeping loft. I used fence palings I got at the tip. I don't want to speak too soon, or talk it up too much, but the internal gable ends could well be my favourite part of the house. I'm in love with them. I'm in love with their roughness, their character, their colours and textures. I'm in love with the fact that they had a life before they came to live with us in our little strawbs, and they are all different. Because I hand cut and de-nailed them all, I feel like I came to know them. I picked out my favourites (often involving extra-special knots, lichen or moss), and saw where insects and other creatures had made their homes and tracks. There's a part of me that would like to make a whole house from them, but I know that their beauty is in the detail, which is better appreciated on a small, cozy scale at the head of our bed. This morning I was at the land at daybreak - my favourite time of day on this little block of ours. A flock of rosellas and rainbow lorikeets and galahs were hanging out on our dam wall, eating the grass seeds we'd scattered for them (not really - they were part of our revegetative soil stabilisation efforts, but I can understand why the birds thought it was a smorgasbord put there just for them) and one or 2 were already trying out the bare-rooted fruit trees that Olive and I planted last week in our orchard. My task today was to mix up some lime wash to paint downstairs. Yes, the clay was a beautiful colour. It was warm and textured and so so earthy. But in a space as small as our tiny cottage, it was also kind of overwhelming. If you've ever been to any of our houses, you'll know that Pearl and I are partial to bright and bold house-decoration stuff. We have lots of pictures and artworks. We have bright woollen rugs on everything. Even our foods and cooking tools are brightly coloured. And in our little strawbs, with its limited storage space, most of this will be on display in some form or another. We were nervous about how it would all look against the warm but dominating clay of the walls. So we decided to limewash. As I brushed it on I felt almost a sense of betrayal, altering the clay walls we'd worked so hard on (this probably gives an indication of just how attached I am to every aspect of our little house). But I'm so glad we're limewashing rather than painting. Limewash is both transparent and opaque, it's textured, it's uneven (a prerequisite for this house of ours), it highlights, rather than disguises, the undulations in our walls and, because it has thin spots, the warmth of the clay still shines through. And, as an added bonus, the wash is binding any loose sand on the surface of the wall, which will help our house be less dusty. The recipe for the wash came from The Cob Builder's Handbook, a resource I discovered only recently, but which has been super-helpful and inspiring. 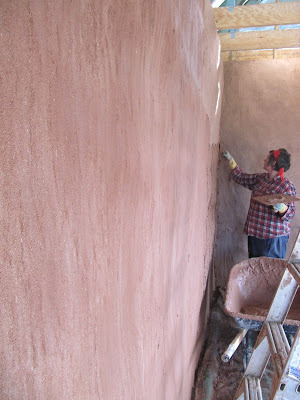 It's super-easy: mix hydrated lime (the stuff we've been using for our external walls) with water to a 'sour-cream' consistency, then let it sit for 2 weeks. This does something scientific (a chemical reaction of some kind?) that was lost on me, but apparently it's imposrant. Then once it's been all scientifically-altered, you mix it with water to a 'skim milk' consistency then paint it on. I had toyed with the idea of using a roller, but painting it, like all the other labour-intensive hand-made-y things about this house, is kind of rewarding. I'm up close and personal, smoothing things out and appreciating each and every nook, cranny and bump. As the morning sun streamed through our northern windows and hit the newly-washed wall, I knew that we'd made the right choice. As we move closer to moving into our house I feel simultaneously overwhelmed, excited, anxious and impatient. The list of things we need to finish before we can move in grows shorter every day, yet some of those tasks that are looming ahead of us seem enormous. Take the eaves, for example. That's the little gap between the top of the wall and the bottom of the roof. I never thought about that little gap, never considered how we'd close it up, what we'd use, how it would be done. But now that Brett and I have started lining the ceiling, I'm noticing that it is quite a gap, and something will need to be done about it. But that task we will come to when the ceiling is lined. Hey - it might even get done after we move in. For now we have more pressing - and BIG - issues, namely the floor and the ceiling. Day 3 after we made our floor, some cracks started to appear. This was not at all what we'd hoped, but it seems that even not-very-wet clay shrinks quite a bit when it dries. The cracks are everywhere. They're quite deep (around 2 inches) and about 1cm wide at the widest part. Not insubstantial, and definitely something that will need to be rectified. Some earth-floor literature suggests using a different-coloured clay slurry in cracks, giving the floor a kind of flagstone look. We're not massive fans of this look, and were really hoping to avoid it. But the thing we realised is that we, in this home-building exercise, have chosen to employ a little lady who has some of her own ideas. That little lady is Mother Earth. Unlike something like concrete, which is man-made and therefore predictable, ye olde clay is Mother-Earth made and therefore profoundly unpredictable. Take our workshop week. April was carefully chosen on account of it being (statistically speaking) one of the driest months in the Bega Valley. But do you think Mother Nature gives a rats arse about statistics? No way Jose. And to prove it, she flogged down on our uncovered bales, just to keep us on our toes. Did we learn? No way Jose! We thought we knew what to expect with this freshly-dug-from-the-earth clay we made our floor from, but we were wrong. Good thing we have a sense of humour. In this photo you can see the double layer batts - thin eh? -a couple of the floor cracks and a space person. Leftover bits of hardwood were used to make sure the floor wasn't damaged by the ladder, though it's definitely hard enough to walk on without leaving marks. Just to be a little different and try out something new for a change, we have decided to fill our cracks with wax. Reasons? I believe it will be easier to fill them up most thoroughly with something liquid, it dries pretty hard and fast, and it might look a little less like flag-stones than if we use clay. But that is a task we will complete after the ceiling is finished. Yesterday Brett and I started insulating and cladding the inside of our lofty roof-space. Let's just say it was not the funnest job in the world, and leave it at that (though Brett did say he felt like we were "playing cubbies"up in the loft with a view of the tree-tops, eating chocolate in what looked for all intents and purposes to be some kind of elaborate dress-ups). Choosing insulation was a major, confusing, exhausting and ultimately inconclusive pain in the arse. So much information, so many salespeople, so much well-intentioned advice. 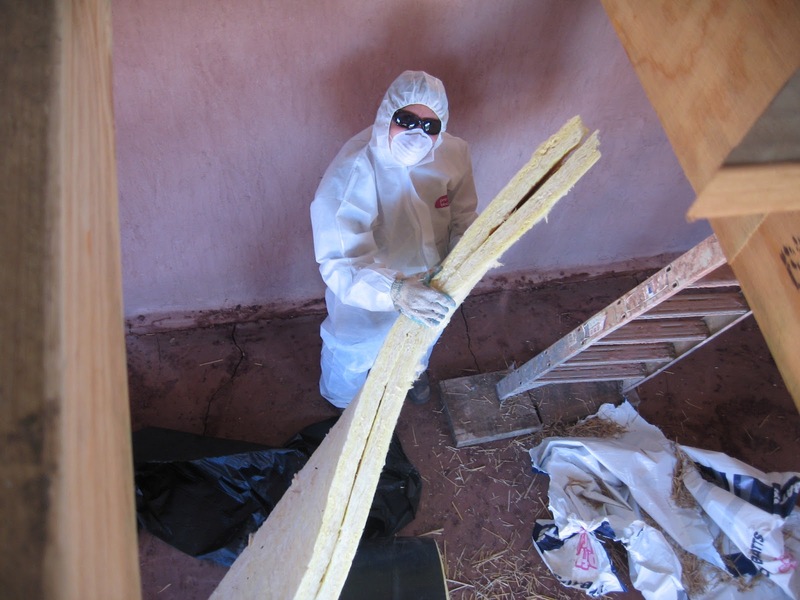 While insulation should always be a big issue, not to be taken lightly, in a strawbale house it's even more so. The walls, you see, are rated to be something like R20. Your average housing batts are something like R3, if you're lucky. I read once that if you build a strawbale house and don't insulate the roof properly, it's basically like building a really expensive chimney. 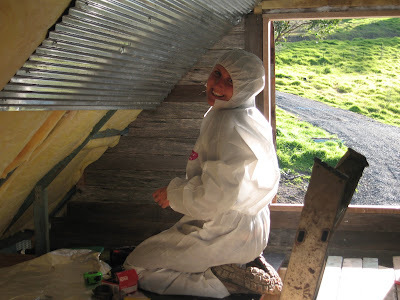 The problem for us with our little strawbs is that the roof space, where we're s'posed to cram tons of excellent insulation, is where we're going to be sleeping. In total, we had about 12cm to fill with insulation. We needed bang for our buck, and bang for the minimal space. What we settled on is a special kind of compressed bulk insulation that is 85% recycled glass, which is spun into fibres and bonded with a glue that is, well, not exactly natural. It's normally used in industrial applications, and we had to order it direct from the manufacturer as it isn't available through any retailers. It wasn't cheap ($2000 for the whole roof), but this was one area we weren't prepared to skimp on. We wanted high performance and high recycled content, while still keeping within the constraints dictated by our tiny roof space. These batts are 5cm thick, so we doubled them, bringing the total to 10cm and, combined with the anticon blanket that is attached under our corrugated iron, we have an R rating of 3.9. Pretty good given the circumstances. In other situations, with other rooflines, Frank uses whole strawbales as roof insulation, creating what he calls an 'esky'. I love this, in theory, and was keen to give it a go, but the roof needs to specially engineered for an application like this, and when we priced trusses for this roof they came in around 3 times the amount we paid, and we wouldn't have had a loft space. 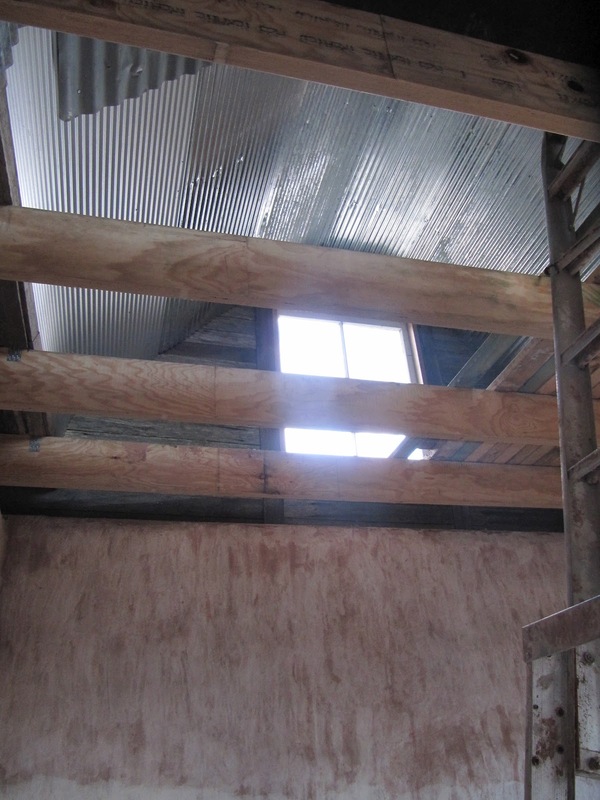 We're lining the ceiling with some mini-orb (mini profile corrugated iron) that I got at Eden tip for about $15 (the savings offset the price of the insulation). Score! But boy oh boy does it need to be painted. That stuff is shiny: at the moment it feels a little less like a cozy lofty treehouse and a little more like a crazy space-pod. Especially in my fibreglass-proof safety suit, goggles, and breathing apparatus. * This blog post has pictures of blood-related activities. If you're likely to be grossed out, maybe get a friend to read it to you so you don't have to see the photos. Last friday Pearl and I spent the day together, just the 2 of us, for the first time in what seems like a very long time. 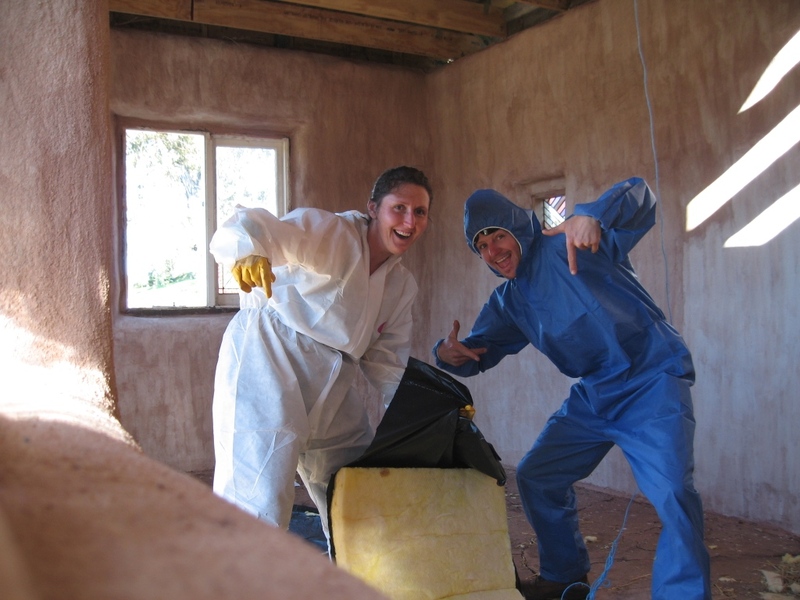 We chatted, ate take-away hamburgers sitting on strawbales in the sun, and finished the third and final coat of render in the little house we're building. Like Pearl said, it was 'kinda like a date', but instead of going to see a movie or a band, we were building a house for our family. Pretty nice. The third coat was on a deadline as it had to be done before we started on our earth floor, which was slated for a sunday working bee. And boy were we busy little bees! I don't remember exactly when I decided that I was really keen on having an earth floor, but I do remember when I decided I wanted to use blood in it. I was reading The Straw Bale House. Unlike many books about natural building, this book actual has a half-decent discussion of earthen floor techniques, though it is sadly lacking in technical instruction. Still, from reading it I learned that in many traditional Native American societies, earth-floor-making was women's work, and blood - usually ox blood - makes an earthen floor REALLY hard. Most things you read, and most people you talk to about earth floors will talk about a poured earth floor - mix up a slurry of clay and/or cement and/or soil and/or sand and/or manure and pour it in wet, the same way you would concrete. Then wait about a million years for it to dry out, in the mean time trying not to worry about the enormous cracks that may or may not form in the shrinking floor material. This always seemed a little stressful to me. Furthermore, a friend who'd house-sat a house with a poured earth floor had commented that it was "like living in a quarry". Ummm… not really the look/feel we're after with our little bothy. Not to mention the fact that we really need to move into our little house as soon as we can - 6 weeks + drying time just isn't an option. I knew there had to be something better, but finding information about earth floors - poured or otherwise - is pretty bloody tricky. But then I came across this blog, which inspired me to start adding 'rammed earth floors' to my search parameters. I still came up with bugger all, but I learned enough to cobble together a method, used both in Japan and Europe, involving a pounded or rammed earth floor which is soaked in blood and then sometimes sealed with oil or wax. I discussed this method with Frank and, with his seal of approval, decided to go ahead and make it happen. Enter the working bee! Friends from near and far (including new blog-met friends Holly and Chris, who have, amazingly, played a gig in a Scottish bothy in their pyjamas) once again rocked up to lend a hand barrowing and bucketing and raking and stomping and sledge-hammering and whacker-packering and blood-painting our clay floor. The blood was obtained from our friendly local organic meat providore, who supplied us with a 20L bucket of steer blood for $20. Pretty reasonable, I thought. Problem was, by the time we came to actually use the blood it was… well… kind of congealed. The problem with congealed blood is that the bits that do the congealing - the platelets - are actually the bits you want in your floor, making it hard. Luckily for us, we had my dad's paint mixer drill attachment handy, so we whipped up a bit of a blood smoothie, and were on our way. Yep, it was kind of gross. Yep, it smelled kind of yuk. Yep, it was surreal, and horror-movie-like, and funny, all at the same time. I suspect that the clay, which we had whacker-packered to within a fraction of a millimetre of its life, was actually a little too wet, and so didn't soak up as much blood as I would have liked. The moisture content of the clay was somewhat mediated by the dry clay (left over from rendering) we had to sprinkle on to stop the whacker-packer from sticking to and lifting up the floor, but the texture, when we all excitedly removed our shoes and walked all over it, was still a little bit like firm plasticine. Our heels sunk in a bit if we weren't careful, but it really was a beautiful feeling, and I love the gentle undulations in the floor. Let's face it - a dead-level floor in our wonky little house would look pretty weird, but we were all pretty impressed with our eyeballing when we set the straight-edge on it and saw that it was actually reasonably level. The blood was applied with a broom and a strange, foam-covered trowel my dad had given us (maybe used for tiling?). We applied it in 2 coats, (the second by torch-light) to let each soak in as much as possible. Now, we wait. When Pearl deems it dry enough (I am notoriously impatient) we will seal it with a blend of linseed oil, citrus solvent and beeswax, and then we'll be done! In the spirit of our entire building journey thus far, our floor-making was a massive learning curve for all of us, involving much head scratching, collaborative problem solving and exclamations of "I think I read somewhere...". When I checked on the floor this morning it was looking pretty good (albeit a little gruesome on account of some still-not-dried blood bits) with no sign of cracking or disintegration or, as Brett had predicted, foxes with their tongues stuck to the floor. Time will tell how the whole thing wears. We're going to glue old carpet to the bottom of all our furniture, and implement a 'no shoes' rule. I'm also making an enormous plaited rag rug, just in case, but I feel safe knowing that we've essentially done what millions of people have been doing for thousands of years (OK - minus the whacker-packer) and made their home from the earth around them. In addition to the $20 for the blood, we spent about $150 on gravel for the sub-floor drainage layer.